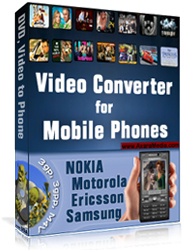 Video Phone Converter, support any mobile phone samsung galaxy, iphone, lg, blackberry. FREE lifetime English support via e-mail within one business day, worldwide. FREE update to usual versions. Enjoy the discount opportunity for another purchase. Copyright Â© 2006 - 2012 AxaraMedia Ltd. All rights reserved.